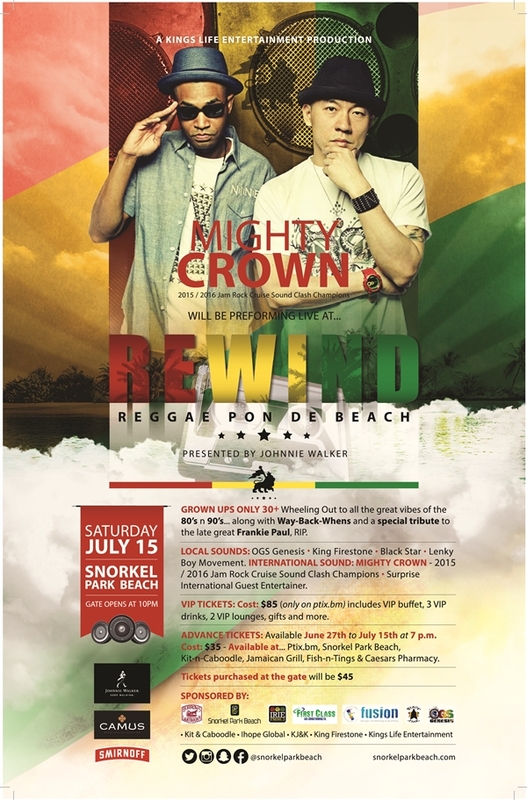 This Saturday [July 15] the two-time winners of the Jam Rock Cruise Reggae Soun Clash, ‘Mighty Crown,’ are set to perform at the ‘Reggae Pon De Beach’ event at Snorkel Park. The group will perform alongside Bermuda’s King Firestone, OGS Genesis, Blackstar Sound and Lenky Boy Movement. The “grown-ups only 30+” event, presented by Johnny Walker, Hazel-inc, and Snorkel Park Beach, is described as “an old school extravaganza for grown folk,” featuring songs of the 70s, 80s, and 90s. Advance tickets are still available at $35 until July 15th at 7.00 pm.